"This romance is truly an affair of the heart and will engage your emotions, as well as your imagination. Connolly's almost-poetic descriptive phrases, well developed scenes, and penchant for complexity even in supporting characters will make you believe you are looking directly into history. ... a beautifully written historic romance, and I recommend it highly. Find a warm spot by the fire on a snowy day, and curl up with this incredible epic. I'm going to go have a second read." "This story was engaging, well written and entertaining. The author's extensive research into the war between North and South shone through the entire story. The characters, particularly Aimée and Lulu, were presented by the author as complete individuals, each with their own unique traits to distinguish them from others. The inspirational aspects were not overdone, but instead were threaded seamlessly throughout the story as it unfolded. Lulu was a wonderful character in her assisting role to Aimée." "Well-written, fast paced historical novel by a most talented author. The book was rich in historical detail"
"Flame from Within is an incredibly well-written, easy to read, impossible to put down, chronicle of one young lady’s journey through the years of the Civil War. Kudos to the author, Ms. Connolly!" "...A story of bitterness, healing, forgiveness and romance, FLAME FROM WITHIN provides a glimpse of Civil War life in the south, while offering hope in the face of loss and hurt. Worth the read, Connolly’s novel is entertaining and encouraging." 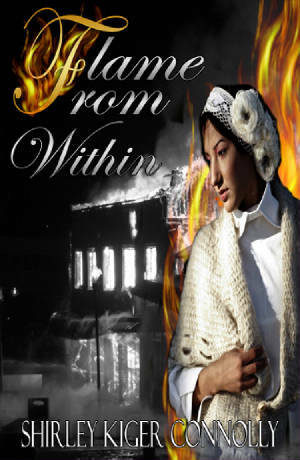 "Flame From Within is a stirring poignant read. One cannot help but be swept into the historical events of the Civil War, and the aftermaths each family shares... Shirley Kiger Connolly pens a great historical read, depicting many ranges of emotions within her characters. This well-written drama shows the betrayal and hatred that sweeps during the war, as well as the solace each injured soul, in time, is able to find when learning to love and live once more. I was truly captivated with this story, and my heart went out to all the characters." "Flame from Within had wonderfully vivid descriptions of the old south and terrific characterizations. Thoroughly enjoyed the story of this Civil War Epic. A real keeper!"